The XKCD online comic strip frequently has some interesting graphics. 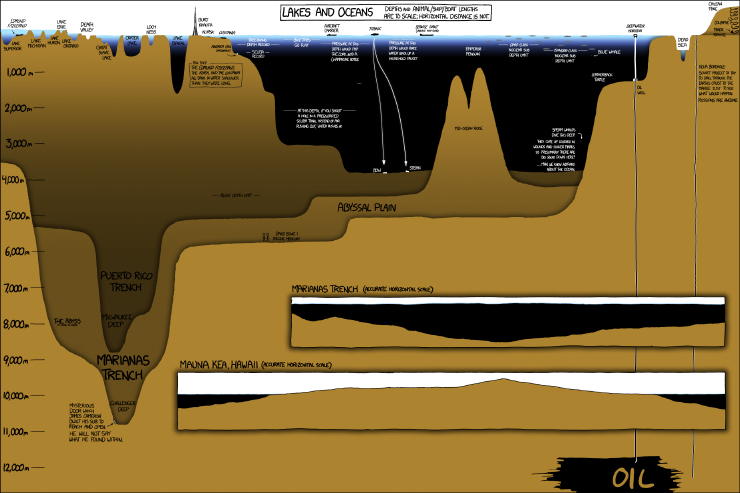 Below is one illustrating the relative depths (and some heights) of places on Earth. The depths and ship lengths show are all on the same scale; the horizontal scale is squeezed together, except for the two insert drawings. The world's tallest building, the Burj Khalifa in Dubai. The depth of the Deepwater Horizon oil well (the source of the horrific spill in the Gulf of Mexico) -- both where it started and how deep it reached!